Whether you have a butcher shop, hair salon or restaurant, they all need one thing: customers. Whereas people used to just ask around for the best Italian place, today they search for it on Google. For that reason it’s extremely important for regional businesses to rank highly on the search engine. In today’s post we’ll give you a few valuable tips for bringing your website up to par for Google. Who is Affected by Local SEO? Local SEO stands for search engine optimization with regard to regional searches on Google. 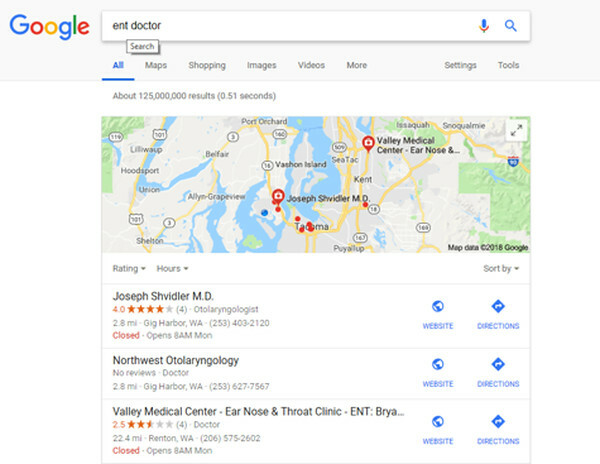 If someone enters the keywords “ENT doctor” he’ll receive a list of nearby earth nose and throat clinics. The searcher doesn’t even have to provide his location. Generally the search engine knows where the user is located. To do this it either uses a smart phone’s geo-tracking data or a computer’s IP address. Thus local SEO is important for all businesses that are dependent on customers from their region. But how do they achieve good Google placement for their business? We’ve collected the most important rules and tips. Google My Business is a free service provided by the search engine. Your entry will be displayed when users do a Google search or use Google maps to find your business or one in your industry. The service allows you to easily create and update your listing. There are several other business directories besides Google My Business. Some of them were even around before the internet moved into every household, so they are of interest specifically to elderly consumers. You can usually register your business for free, or you have the option to do a paid listing. For regional search engine optimization the free version is sufficient. Many of these directories also serve as reference networks which allow their businesses to be rated. In order to play a role in local search results, a Facebook page is also a must. It is easy to set up and you can use it to quickly communicate with your customers, for example if your business hours change on short notice. A Facebook post does the job. Changes to hours of operation and similar important information can also be noted in the trade directories previously mentioned, including Google My Business. A responsive website is an Internet page that displays on a PC just as well as it does on a smart phone. It really is obligatory to have one now, since 79 percent of all smart phone owners in Germany search either mostly or even only with their phone. With tourists that number is even higher, because they hardly have their PC with them. But you don’t need to worry about having to pay vast sums of money to a website designer or advertising agency for a site optimized for use with mobile phones. It’s sufficient to build your site yourself with a “homepage kit.” The kits are self-explanatory and easier to use than Excel. Many website providers have also integrated these homepage kits into their offerings. Just take a look at your customer account, you may already have access to one. Other recommended homepage kits are offered by SITE123, Wix or Jimdo. Note: All design themes in a homepage kit should be responsive. However some vendors still have themes in their portfolio that are not smart phone optimized. So always make sure that a theme is described as being responsive. Your hair salon has two telephone numbers and besides the street address, also has a P.O. box? Make sure that you keep your name, address and telephone number written consistently in all directories, as well as on Facebook and on your website. This is the only way to avoid confusion for searchers, and for Google to always know that the business in question is yours. Where possible, so on Google My Business, Facebook and your website, publish pictures of your business. It’s best to do both inside and outside views. Wait for good weather to take the exterior picture. Everything looks a little nicer in sunshine. Or take a night shot with your brightly illuminated shop window. For inside views, a person in action should be depicted. That makes the image lively, and vibrant images are clicked on more often by searchers. A lot of clicks is a sign to Google that your business is important. Meta tags provide Google information about your website. Besides containing technical instructions, the search engine also constructs information from them that users see in the search results list. The most important tags for this are the title tag and the meta description. It is therefore important to fill in the corresponding fields for the meta tags with information that prompts the user to click on your website. Here you can find useful suggestions on how to properly format good meta tags . Alt attributes are used to provide alternate descriptions for images and graphics. They are often forgotten, but enormously important for search engines. The alt attribute gives clues about the image and about the general context. The context in turn has an effect on whether or not a website is classified as pertinent to a search query. How to add specific alt attributes and additional details about your SEO significance were already covered in a clickworker blogpost from 5/17/2018. This is where to find our relevant article on the topic of alt attributes. When creating copy for your website, pay attention to the regional aspect. Don’t just write about your restaurant, write about your restaurant located in the heart of Rochester. Precise directions to your business are also very helpful. Be sure to mention the closest bus stop or freeway exit too. That makes the regional connection even larger. In addition you should also integrate Google Maps into the directions to your establishment. Backlinks, which are links that point to your website, don’t have as much relevance for SEO as they used to, but are still important. To get backlinks, simply contact other businesses and ask if they could mention your website on their homepage. As an incentive you could offer to put a link to them on your site. Only businesses that operate in complementary branches lend themselves to this kind of link exchange. For example a business that sells hairdressing supplies is well-suited to reference salons that use their products. To reach Apple users as well, you should register your business with Apple Maps. That way you’ll be found quickly by iPhone and iPad users. To be relevant for Google, you need reviews. And you don’t need to worry about negative opinions either, because Google doesn’t evaluate the content. Starting with six reviews Google can calculate an average value for your business. So encourage your customers to leave reviews for your establishment and it will climb higher in regional search results. Please don’t: Even if it’s tempting, please don’t rate yourself. A business that only has positive reviews seems suspicious to almost all customers. We hope that you can significantly expand your Google ranking in the local context with our tips. If you still have questions or suggestions, write to us or leave a comment. Dieser Artikel wurde am 17.July 2018 von Thomas geschrieben.